PUNK is about shock and irony and anarchy, and generally treading hard on the toes of those who walk the boring middle line, culturally speaking. But make art that embodies the punk spirit and suddenly you’re not hanging out in the gutter, you’re standing smack in the middle of the very straight legal world. Portrait of M. Contraband, Esq. 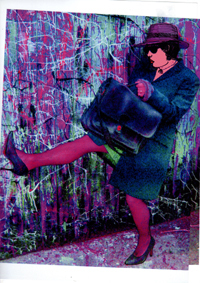 If you steal this photo, this PUNK lawyer-artist may be totally on you! For artists like Jeff Koons and Damien Hirst, shock and irony are their stock in trade. And in the process of creating iconic ironic visual statements they’ve occasionally tread on other people’s copyrights with a style worthy of Johnny Rotten himself. Appropriation art sits comfortably alongside sampling and mashing in music but isn’t anything new. It’s straight out of the Duchampian tradition but goes well beyond the act of taking a found object like a urinal, placing it in an art exhibition and re-christening it The Fountain. From a copyright law perspective, it’s fine to do whatever you want with an old urinal (unless it’s an artwork like Marcel Duchamp’s, in which case you might be violating the artist’s “droit morale”, the artist’s moral right against altering the work—but that’s another story). But it’s not fine to take somebody else’s work and basically just reproduce it, albeit every so much bigger and brighter and more expensive. Two cases in point: Jeff Koons’s String of Puppies (1998) and Hirst’s Hymn (1999), each of which appropriated culturally mainstream images. In both instances, the artists took someone else’s copyright-protected work and instructed assistants/fabricators to make a large-scale, three-dimensional, colour copy of it. In the String of Puppies case [Rogers v. Koons, 960 F.2d 301 (2d Cir. 1992)], the appropriated image was the work of a little-known commercial photographer who had made postcards with an image of a man and woman holding a large litter of puppies in their arms (very sweet and unpretentious, or kitsch and low-brow, depending on one’s point of view). In both instances, Jeff Koons and Damien Hirst faced legal challenges for copyright infringement. Jeff Koons’s case went to trial and Damien Hirst’s didn’t as it was settled out of court, but both ended up paying compensation. So far, so punk—sometimes you take a chance and get a kicking. But there was an up-side in terms of high-profile press coverage, especially for Damien Hirst when Charles Saatchi bought Hymn. And Punk Lawyer will be the first to give credit to Jeff Koons and Damien Hirst for arguing that artists should have the freedom to mine the rich and varied terrain of popular culture for the purpose of social comment and parody. They are certainly not the first to do so, and in many cases there’s no legal problem with it anyway. US copyright law (and to a somewhat lesser extent in the UK) has a pretty generous fair use exception for that kind of thing; otherwise, we wouldn’t have Two Live Crew’s classic re-make of Roy Orbison’s Pretty Woman, for example, and how could anyone live without that? The case suggests that Jeff Koons prevailed mainly because Niagara (2000) had a lot more content than just the one photograph he copied, resulting in a new work that the judge called “transformative”; in other words, the Court decided it had sufficient originality to transcend the element of copying. So there’s a lesson for artists who want to operate within the parameters of copyright law—be original. And cheers for freedom of expression even if Jeff wasn’t awarded the extensive sums spent on lawyer’s fees and costs. Niagara features some very enticing and expensive looking footwear indeed, and is bound to appeal to folk blessed with large pension funds unscathed by current economic crises and a closetful of Manolo Blahniks; not to mention Punk Lawyer, whose eclectic tastes do not shy away from high fashion stiletto heels and strategically torn fishnet hose. But as far as social commentary is concerned, a cursory analysis of Niagara suggests an allusion to the unforgiving dictates of women’s fashion contrasted with the irresistible appeal of American style doughnuts. But we digress yet again— this a subjective matter, one for the art critics to chew over. Back in the UK, Damien Hirst has been slamming away in a different direction. The master of irony who so boldly appropriated a copyright in its entirety to create Hymn and sold it for a reported million pounds, recently was reported in The Independent to have stopped an enterprising teenage artist, Cartrain, from using a copy of a picture of his diamond-encrusted skull sculpture For the Love of God in a collage and selling copies of it on the internet for £65. In the face of what probably seemed a daunting legal challenge, the young entrepreneur relinquished remaining copies of the work and duly ceased and desisted production. One wonders however, if he’d had a million or so to spend on a lawsuit, he might have hired Jeff Koons’ legal talent to try to make a defence of “transformation” along the lines of the Niagara case. But perhaps the lad will make his career on the back of the publicity. Whatever happened to cutting-edginess? Punk nihilism points to defying cultural norms, and in the culture of acquisition in which we live, the norm is to protect narrow economic interests. Damien, why not opt against the norm by allowing emerging artists to use elements of your work to say something new? And Jeff, how would you react if someone used a bit of your work to make a point? There are a lot of emerging artists out there, and you never know what they might do. We’re just sitting here eatin’ doughnuts and spit-shining our diamanté-encrusted stilettos. Clare Dyer (legal correspondent). (19 May 2000). 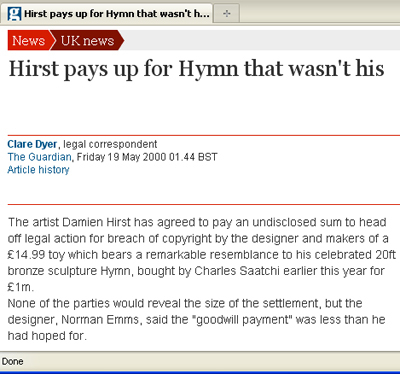 "Hirst pays up for Hymn that wasn’t his", The Guardian. Arifa Akbar (arts correspondent). (6 December 2008). 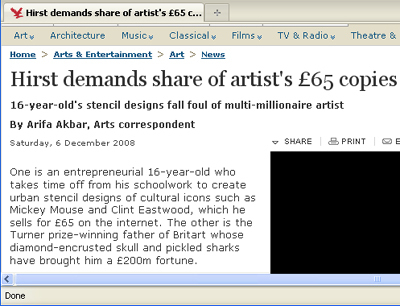 “Hirst demands share of artist’s £65 copies: 16-year-old’s stencil designs fall foul of multi-millionaire artist”, The Independent.